An abundance of opening day shocks in the first round of the Men’s Singles event; the question posed on the second day of play, Friday 27th July, at the Seamaster 2018 ITTF World Tour Platinum Australian Open in Geelong is who can maintain the form and book quarter-final places? Only three of the top eight seeded players remain, China’s Xu Xin, Japan’s Tomokazu Harimoto and Frenchman Simon Gauzy; all of those players in the lower half of the draw who have yet to start their campaigns. The no.2 seed, Xu Xin meets Japan’s Taimu Arinobu; Tomokazu Harimoto, the no.5 seed, opposes Chinese Taipei’s Chen Chien-An, Simon Gauzy, the no.7 seed confronts India’s Sharath Kamal Achanta. 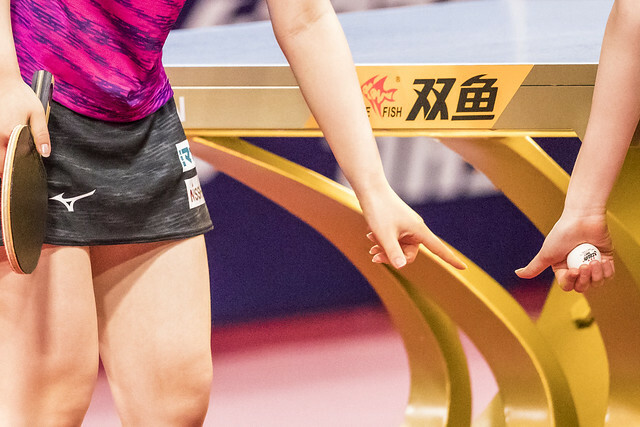 Xu Xin, who despite his early exit last week at the Seamaster 2018 ITTF World Tour Platinum Shinan Korea Open at the hands of the host nation’s Jang Woojin, is now the clear favourite for the title. However, the intriguing question is whether his colleagues, who caused major opening day shocks, can maintain their form. Zhou Yu, who is overdue for an ITTF World Tour Men’s Singles title, having been the runner up on three occasions, meets the winner of the contest between Japan’s Masaki Yoshida, the no.15 seed and Indian qualifier Sathiyan Gnanasekaran. Somewhat similarly for Liu Dingshuo, who ousted Japan’s Jun Mizutani, the 2016 champion when the tournament was staged in Australia, he faces the winner of the contest that features the host nation’s David Powell and Chinese Taipei’s Lin Yun-Ju. Somewhat differently for Yu Ziyang, who in the opening round accounted for Germany’s Dimitrij Ovtcharov, the top seed, the second round opponent is known, He plays Japan’s Maharu Yoshimura awaits. Somewhat conversely in the Women’s Singles event, the leading names all remain with both Japan’s Kasumi Ishikawa, the top seed and China’s Liu Shiwen, the no.2 seed, facing colleagues in the second round who are more than capable of causing upsets. Kasumi Ishikawa opposes Saki Shibata, the no.13 seed, Liu Shiwen confronts Gu Yuling, the no.11 seed. Testing opponents, it is the same for Mima Ito, the no.3 seed and Miu Hirano, the no.4 seed; both from Japan, Singaporean qualifiers await in round two; Mima Ito plays Zeng Jian, Miu Hirano opposes Yu Mengyu. Notable names but note one name that is progressing quietly and most effectively. China’s Ding Ning, the no.7 seed, opposes Korea Republic’s Suh Hyowon, the no.9 seed in round two. Meanwhile, in both the Men’s Doubles and Women’s Doubles events, at the end of the day the finalists will be known. In the round of the last eight pairs, Korea Republic’s Jeoung Youngsik and Lee Sangsu, the top seeds, meet Indian qualifiers Sharath Kamal Achanta and Sathiyan Gnanasekaran. However, look at the pair awaiting Japan’s Masataka Morizono and Yuya Oshima, the no.2 seeds and runners up at the Liebherr 2017 World Championships; they meet Chinese Taipei’s Chen Chien-An and Chuang Chih-Yuan, the no.5 seeds and the winners four years earlier in Paris. Four players who have competed in a World Championships Men’s Doubles final; in the penultimate round of the Mixed Doubles, it is five players who have gained that honour. At the semi-final stage, Chen Chien-An and Cheng I-Ching, the no.3 seeds, the runners up at the Liebherr 2017 World Championships in Düsseldorf, oppose the top seeded combination of Lee Sangsu and Jeon Jihee, also from Korea Republic. In the opposite half of the draw Maharu Yoshimura and Kasumi Ishikawa, the no.2 seeds and winners in Düsseldorf, face the no.4 seeds. They oppose Korea Republic’s Lim Jonghoon who partners Yang Haeun, the winner in harness with Xu Xin at the Qoros 2015 World Championships. Japan prominent; it is the same scenario at the quarter-final stage of the Women’s Doubles event. Hina Hayata and Mima Ito, the top seeds, meet colleagues Miu Hirano and Miyu Nagasaki, the no.5 seeds; Honoka Hashimoto and Hitomi Sato, the no.2 seeds, face Chinese Taipei’s Cheng Hsien-Tu and Liu Hsing-Yin, the no.6 seeds. An enthralling day awaits in Geelong.